The EL2202 digital output terminal connects the binary control signals from the automation unit on to the actuators at the process level with electrical isolation. This terminal benefits from very small output delay and is therefore suitable for signals requiring particularly fast output. The EtherCAT Terminal supports distributed clocks, i.e. output data can be monitored synchronously with other data from terminals with distributed clock support, if the user switches to terminal version EL2202-0100 (see documentation). The DC accuracy across the system is < 1 µs. 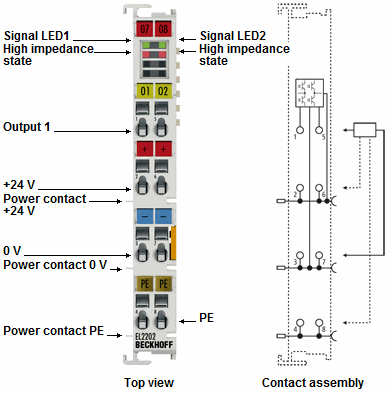 The EtherCAT Terminal has a push-pull output that enables the output to be connected actively to 24 V, 0 V or high-resistance. The EL2202 contains two channels, whose signal state per channel is indicated via LEDs. Special features Can be converted to DC version EL2202-0100. Outputs can be connected in high-resistance mode.